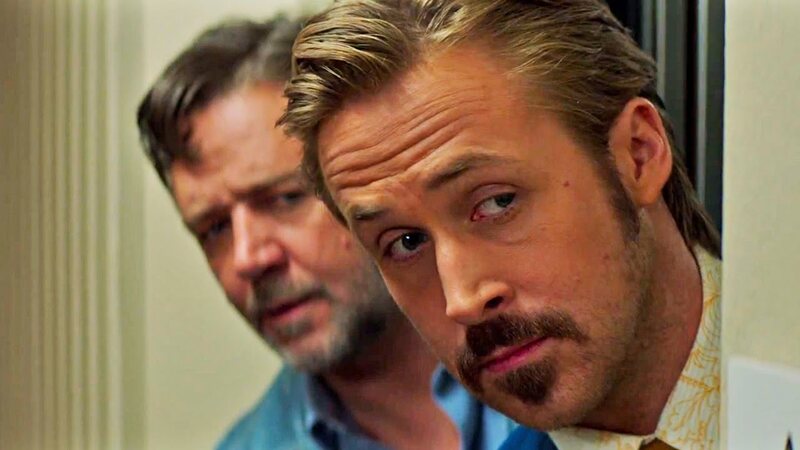 "'The Nice Guys' fully fuses with exactly the kind of chops Shane Black has always been best at, delivering a solidly refreshing yet suitably retro production of 70s noir and adult pop culture." Writer/Director Shane Black jumps back into his buddy comedy roots this year. When he tried his hand in the superhero whirlwind with Iron Man 3 (2013), at its core were several quirky relationships and riffs flying between characters, which were not only suitable for the character of Tony Stark, but emphasised how much buddy energy Black still had on top of crafting an action spectacle. The Nice Guys fully fuses with exactly the kind of chops Shane Black has always been best at, delivering a solidly refreshing yet suitably retro production of 70s noir and adult pop culture. Holland March (Ryan Gosling) is an alcoholic private eye in 1977 Los Angeles, swindling his way through clients by feigning good results, whilst also trying to maintain a semi-fractured relationship with his young daughter (Angourie Rice) who disapproves of his methods. Jackson Healy (Russell Crowe) simply gets hired to enforce and hurt people. Naturally, the unlikely duo end up working together when a young girl from the neighbourhood goes missing, and anyone with some kind of connection winds up dead. By writing and directing the film, Shane Black has introduced the world of 1987’s Lethal Weapon to a new generation. The aesthetic and pulpy atmosphere of 1970s Los Angeles are fully utilised to wrap the characters in a rich and believable background of neon lights, huge car boots, and exotically coloured suits. You’re fully in the period, you understand where the characters are from, what roles they’re playing, and there’s nothing to make you question the setting. Because the setting is so instantly absorbing, the characters shine through as clear cut and interesting, building as their rich and sharp character interplay comes in waves of deliciously satisfying gags. Ryan Gosling showed us earlier this year in The Big Short that he is very capable of pulling off quick sharp comedy, but the difference here with Holland March is that it’s a lot easier to sympathise with why he can be a slight degenerate. He has a tender back story and when he pulls off quips to counter Russell Crowe’s hard knuckle brute force you laugh along with him because you can understand where his attitude comes from. Gosling also pulls off some great pieces of physical slapstick comedy: adopting the stance of ‘falling with style’ – yelling like a girl, rolling drunk spectacularly down a hill, and wildly internally screaming and waving hysterically when he finds a body. These gags bring in the biggest laughs. Crowe serves as a fitting counterpart to Gosling, bringing the brawl but also a great deal of the brains to the operation; it’s great to see the duo isn’t clearly divided between smart and tough, and they both carry themselves holistically with their own flaws and talents. Encouragingly, we also have a meaningful supporting performance by Angourie Rice. Generally, roles such as the central character’s relative are very side-lined, with the character tagging along for the cutesy side of things, providing relief for the darker character, or as a mechanism to bring about a final act showdown. Michelle Monaghan as Tom Cruise’s wife in MI:3 was only there as something for Ethan Hunt to fight for in the last act, for example. That doesn’t happen here however, Rice has her own motivations and plays an integral part to the story, holding her own and bringing out many laughs and nudges, steering March and Healy’s strong character development. A worthy role that should hopefully kick-start a promising career. The film’s action plays out with a ripe brutality where blood splatters, knuckles crunches, and flashy gun firr are dealt out without any limitation. As big studios are obsessed at keeping blockbusters lower than an R rating in order to maximise box office potential, it’s simply beaming to see an all-out mainstream buddy comedy with attitude and violence. The only unsure part of the film is its overarching plot, and although it will appeal to the audience majority, ends up not amounting to very much. Thankfully, all other elements of the film are so sure footed and confident in where they’re going, it’s very easy to forgive the film for its somewhat wispy narrative handling towards the crux. The Nice Guys represents a showcase for some of the great buddy comedies of the 1980s whilst enriching a new audience into its world without watering down its hard edges. Ryan Gosling works well as a physical and sharp comedy performer, and Russell Crow shines as a beefcake with a moderate amount of intelligence. For those suffering slight superhero/action blockbuster fatigue at this point in the year, this will provide the perfect refreshing antidote. Cracking stuff.